Nearly 100,000 refugees in Gaza face a second winter without proper housing, with just one of their homes rebuilt since being damaged or destroyed in Israel attack last year, said a United Nations agency that provides assistance in the region. 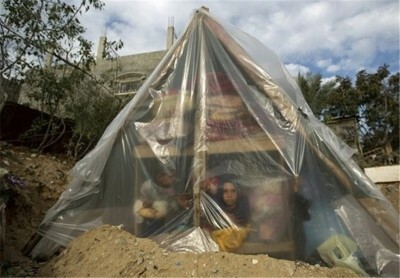 Families are living under tarpaulins, in animal shacks or with relatives and last winter, at least three children froze to death, said a spokesman for the United Nations Relief and Works Agency for Palestine Refugees in the Near East, known as UNRWA. “As the winter approaches, one shudders how these people are going to survive,” the UNRWA spokesman, Christopher Gunness, said in an interview, Reuters reported on Friday. The agency helps some 5 million Palestinian refugees in Gaza, the occupied West Bank, Lebanon, Jordan and Syria. “What these people need is proper homes,” he said. Reconstruction in the enclave of 1.8 million people is hindered partly because of a lack of funds and partly because of a blockade that restricts goods entering and leaving Gaza, Gunness said. During last year’s 50-day war, Israeli airstrikes and shelling hammered the densely populated Gaza Strip causing widespread destruction of homes, schools, hospitals and factories. More than 2,100 Palestinians were killed, mostly civilians. Israel put the number of its dead at 67 soldiers and six civilians. “The underlying dynamics that saw the war in 2014 are still there,” Gunness said. “Indeed they’ve probably got worse because in 2014 there weren’t 13,000 families whose homes were uninhabitable. “Even if Gaza was reconstructed magically tomorrow morning, unless Gaza is allowed to function economically, then it’s hard to see how the instability is going to go away.” The World Bank said in May that blockades, war and poor governance have strangled Gaza’s economy and the unemployment rate is now the highest in the world. It stands at 43 percent, rising to 68 percent among people ages 20 to 24, the World Bank said. There have been no significant exports from Gaza since 2007. Israel maintains tight controls on the movement of goods and people in and out of the territory. Currently, 90 percent of water in Gaza is undrinkable, and the population relies almost completely on a coastal aquifer which could become unusable next year, UNRWA said. Most Gazans consume between 70 and 90 liters a day, below the World Health Organization standard of 100 liters per person per day, the agency said. The number of people receiving UNRWA food aid has risen to 860,000 from 80,000 in 2000, Gunness said. They will become reliant on water aid as well as supplies dwindle, he said.